Hand selected on the day by award-winning chocolatier Marc Demarquette, this luxury Tasting Box contains a selection of 30 flavoured ganache chocolates. 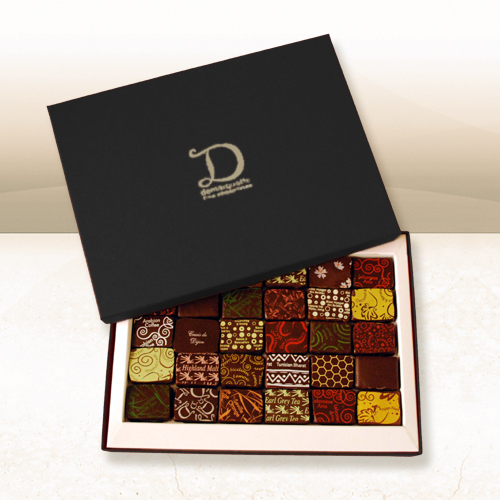 We do not buy our couverture chocolate 'off the shelf' but offer you products made with only highest quality ingredients that are entirely bespoke and unique to Demarquette. Having won over 50 prestigious awards since we launched in 2006 is a testament to the lengths we go to to offer our customers truely inimitable and exclusive products. Each individual ganache chocolate, unless indicated, is made and enrobed with our very own 2012 triple gold star award winning (Great Taste Awards) CacaoLux house blend from the Dominican Republic, Ecuador and Madagascar. It's a luxurious and unique blend made following a unique recipe created by Marc Demarquette. We continuously rotate our flavours and during busy periods will have most flavours in stock at any one time, including some additional special seasonal flavours for you to enjoy. Depending on the season and availability there will be a minimum of 9 flavours in this box. Our range of chocolates are made using the freshest cream and real fruit and spices.